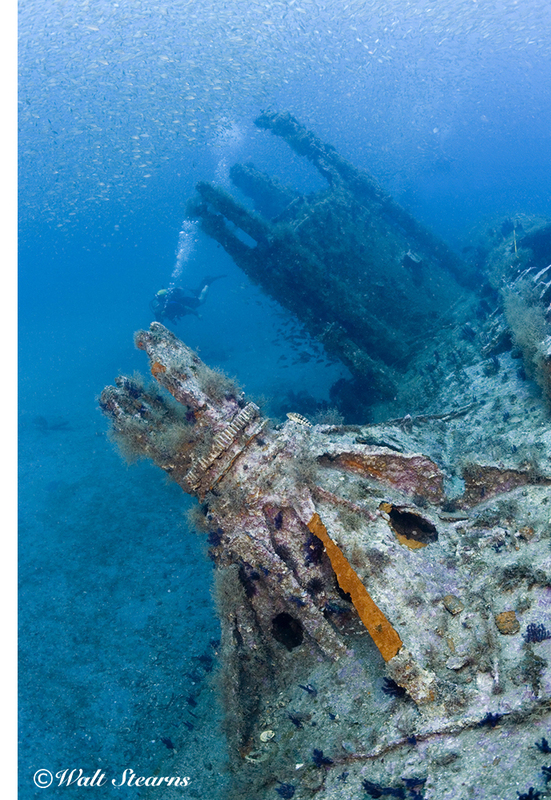 Diving one of North Carolina’s most famous World War II shipwrecks, this largely intact German U-boat in 110 feet of water is something that needs to be seen and experienced. 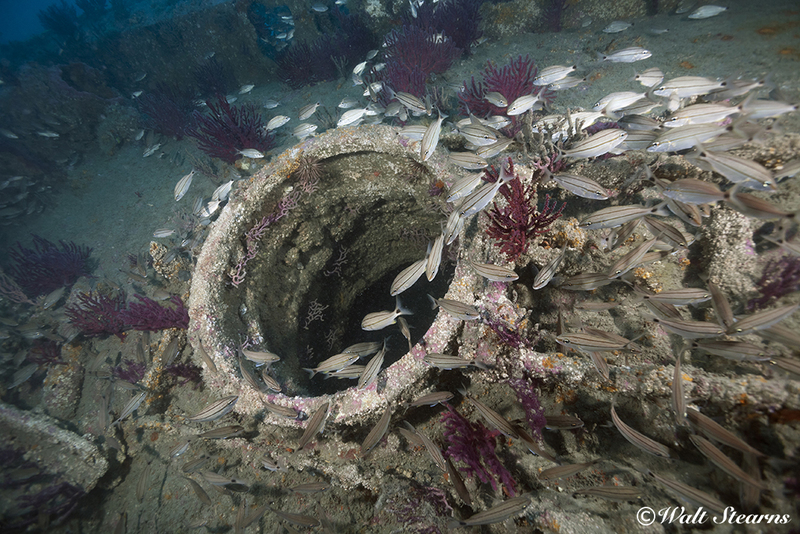 As most Atlantic wreck divers know, many of North Carolina’s Outer Bank wreck sites were the result of the "Battle of the Atlantic." During the early stages of Word War II, Germany's marauding U-boats brought their ocean campaign of destruction right on our doorstep, and they proved to be one of the most fearsome and effective weapons in the history of naval warfare. Under the command of Admiral Karl Donitz, Germany’s U-bootwaffe (German for boat fleet) launched their first series of strikes against American shipping in the finals days of 1941. Known as operation “Paukenschlag” (Drumbeat), the attacking force was comprised of five IX class, long-range boats. 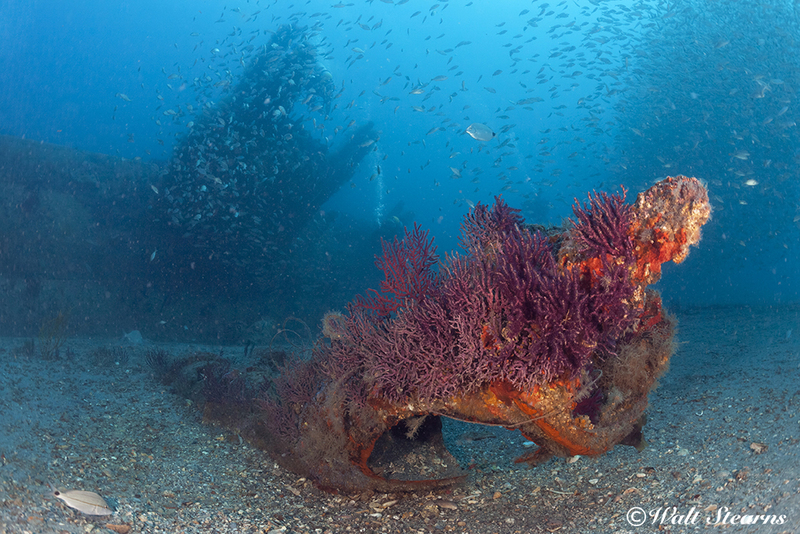 Mangled in battle, now covered in coral, the U-352’s snorkel lies separate from the conning tower that once held it. Between their arrival in US territorial waters, December 27, 1941 and February 6th, 1942, the drumbeaters sank 25 ships. By the close of that same year, U-boat operations along the U.S. continental shelf had swelled into a seemingly unstoppable force that rampaged from Maine all the way into the Gulf of Mexico. My father, as a boy growing up near the Outer Banks, would watch the fires of their victims burn, then fade into the black veil of night. In the span of one year, the U-boat kills reached close to 100, while sustaining only 21 losses of their own. In response to this hidden threat, allied forces organized convoys with naval escorts. Homeland defense forces deployed long-range aircraft patrols and cruisers armed with depth charges, and at the same time worked diligently to develop more sophisticated sub hunting measures. These measures included everything from improving active sonar systems to radio triangulation and cracking coded intercepted messages. It was the breaking the enigma code that eventually made service aboard U-boats almost suicidal. By the end of 1942, the number of U-boats destroyed stood at 64. During the first months of the following year, 94 boats were sunk, culminating in the fleet’s darkest time, Black May, when 41 subs were killed and another 37 damaged in one month. One of the victims of this onslaught was the U-352. At 218 feet long, the U-352 was a VIIC design, which included a 88mm deck gun mounted forward of conning tower. Surprisingly, this vessel had not one kill to her credit. Worse yet, on May 9th 1942, the second— and soon to be last—ship she fired on was the US Coast Guard Cutter Icarus. Dogging the U-352's torpedoes, the Icarus made her own attack run, deploying five depth charges which severely damaged the U-boat internally, wrecked the conning tower and blew off the deck gun. Two more depth charge attacks forced the U-352 to the surface where its commander KL Rathke ordered his crew to scuttle and abandon the ship. In the end, 17 of her crew were killed, with the rest taken in to Charleston as prisoners of war. For a battle that was so well recorded, nobody knew the exact whereabouts of U-352 until Captain George Purifoy (the originator of Olympus Dive Center), Rod Gross, Dale McCullough and Claude Hall (who started the search through extensive research of WWII naval archives) decided to seek the downed sub. Their hunt went on for 10 years before it was found in April 1975, a full mile and a quarter from the original coordinates logged by the Icarus. 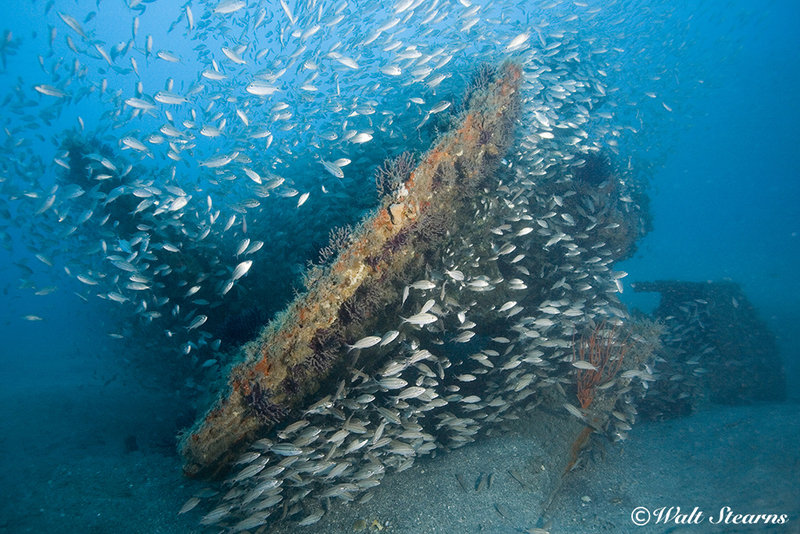 Today, the U-352 is one of North Carolina’s signature wreck sites. For divers making the journey to Morehead City, it stands near the top of the list. Even with the dive briefing fresh in your mind, seeing the U-352 materialize off the bottom, sitting with a 45-degree list to starboard, is an amazing sight. Located some 35 miles offshore, the U-352 lies within close proximity of the Gulf Stream, which often times rewards divers with visibility upwards of 100 feet. Following the descent line toward the bottom, my first impression of the wreck was surprise at it's relatively slender diameter. Living quarters on most medium size attack class warships from this era was far from luxurious. Life on a U-boat with a maximum width of just 20 feet stuck me as incomprehensibly claustrophobic – even when no one was shooting or dropping explosives on you. While still largely intact, most of what you see on the bottom is the remains of the pressure hull as the majority of the U-boat's outer casing has rusted away. The U-352’s aft rudder shrouded in baitfish. 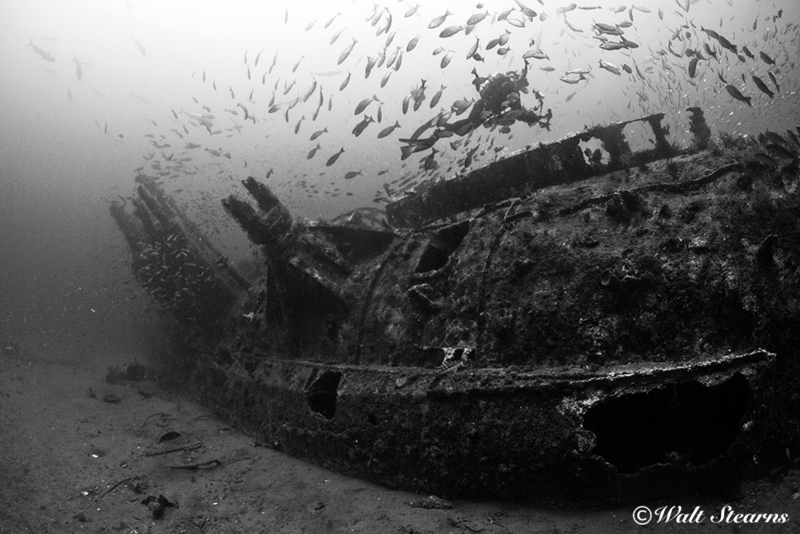 As I worked the wreck for a few choice images, the non-photographer in me wandered down a different path. Through the years I had the opportunity to dive a large number of wrecks, most victims of storms, collisions with reefs and even a few sunk by German U-boats. But being able to actually rest my hand on one of these man-made predators for the first time was powerful stuff. 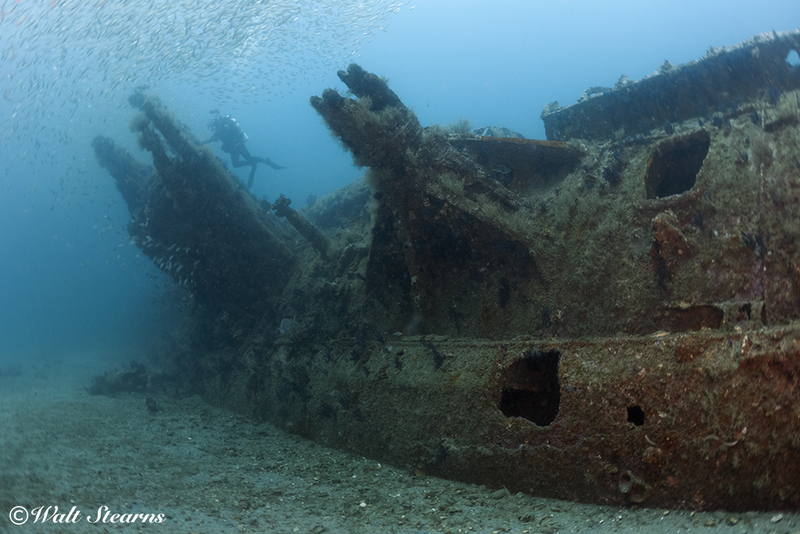 Even among experienced Outer Banks divers, the biggest challenge to diving the U-352—as with most area wrecks at depths greater than 70 feet—is waiting for the boat to hook up on the wreck and set the down lines. The procedure calls for a member of the crew to carry a line and physically tie into the wreck. In the U-352’s case, this is a 120-foot swim to the bottom, before anyone else can enter the water. Depending on conditions, the drill can take 15 to 20 minutes. To expedite this process, Olympus Diving Center’s divers are equipped with underwater communication gear. From the bottom, the diver can advise the captain if he needs to move the boat or pay out more line, as well as give a detail report of conditions from top to bottom. 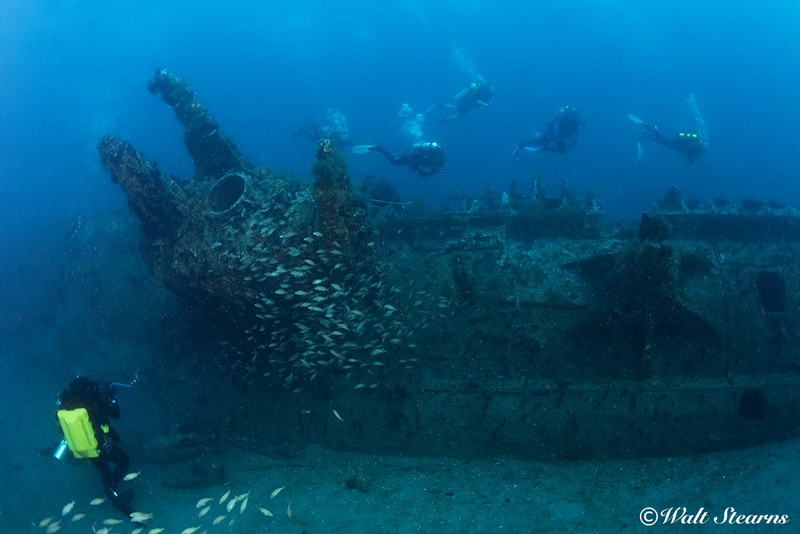 The controlling variable when diving the wrecks of North Carolina’s Outer Banks is the weather. One day it can be great, with calm seas and blue water, while the next day can turn absolutely foul, with either strong winds and rough seas, or just plain grim visibility in the 10- to 30-foot range. The most influential forces of nature is the Gulf Stream, which contacts the eastward protrusion of the banks as it flows northward. As a result of the Stream, summer water temperatures can average in high 70’s, sometimes rising into the in low 80’s, with underwater visibility upwards of 100 feet. On many of the area's wreck sites, there is often enough current to make the use of a down line imperative. 0 Comment(s) to the "Ghost of War, the U-352 "